This program provides currently certified New Jersey teachers, in any subject area, an endorsement to teach Mathematics K-12 through a combination of NJCTL's Online Courses for Teachers; Field Experience Courses; and Praxis II examination. NJCTL's Online Courses for Teachers provide all the required instruction in both mathematics content and teaching methods. Teachers complete the first three Online Courses for Teachers; Teaching Methods (MET-6101), Learning,Teaching Pre-Algebra (MATH-6401); and Learning and Teaching Algebra I (MATH-6403) before entering the classroom in the fall. 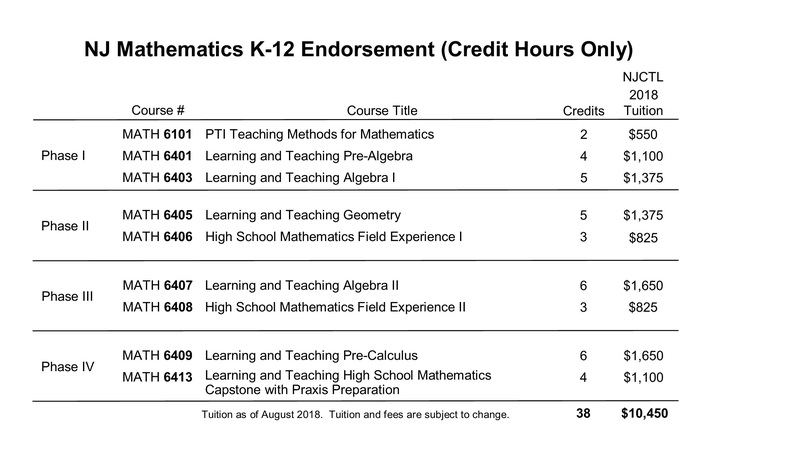 Teachers then take two Field Experience Courses, MATH-6406 in the fall and MATH-6408 in the spring, in which they teach PMI Algebra I to at least one section of students while receiving coaching and support from NJCTL. During the Field Experience, teachers take two additional Online Courses for Teachers; Learning and Teaching Geometry (MATH-6405); and Learning and Teaching Algebra II (MATH-6407). At the end of the field experience and continuing into the summer term, teachers take two final Online Courses for Teachers, Learning and Teaching Precalculus/Introductory Calculus (MATH-6409), and High School Mathematics Capstone with Praxis Prep (MATH-6413). Upon successfully completing these seven Online Courses for Teachers,the two Field Experiences Courses, and passing the Mathematics Content Knowledge (5161) Praxis, the candidate can apply to the New Jersey Department of Education for an endorsement to teach Mathematics K-12. This teacher endorsement program is approved by the New Jersey Department of Education. Click here to view the program of study with costs for the NJCTL NJ Mathematics K-12 Teacher Endorsement Program with CSU-Global graduate credits. Additionally, individuals who complete the NJCTL NJ Mathematics K-12 Teacher Endorsement Program are eligible to go on to complete a Master of Science in Teaching and Learning with Subject Matter Specialization in Mathematics K-12 degree with CSU-Global. Click here to learn more about the NJCTL/CSU-Global MSTL with Mathematics K-12 Specialization with NJ Mathematics K-12 Teacher Endorsement program. Click here to view the program of study with costs for the NJCTL/CSU-Global MSTL with Mathematics K-12 Specialization with NJ Mathematics K-12 Teacher Endorsement. Click here for our Mathematics K-12 endorsement program developed for teachers outside of NJ. Click here for the NJCTL/CSU-Global MSTL with Mathematics K-12 Specialization (not seeking NJ endorsement). Click here for the listing of all NJCTL mathematics courses available for credit.